The "Delivering community benefit: Healthy food playbook" is a suite of resources to support hospital community benefit professionals and community partners in developing community health interventions that promote healthy food access and healthier food environments. If a facility has identified obesity, food access, or diet-related health conditions among the priority health needs in its community health needs assessment (CHNA), then initiatives to promote healthy food access and increased consumption of fruits and vegetables can be important components of an implementation strategy to address these needs. The playbook has several sections with resources to support different stages of the community benefit or community health planning process. Each resource provides examples and links to learn more. These resources will inspire and strengthen your efforts to promote healthy and vibrant communities with healthy, sustainable, and equitable community food systems. Nonprofit hospitals are required to maintain community benefit programs to maintain their tax-exempt status. The principal form of this public benefit historically has been—and continues to be—the provision of free or reduced-cost care to patients unable to pay for health care services. However, recent changes to community benefit regulations have encouraged hospitals to become more involved in community health promotion and disease prevention. The Affordable Care Act established additional community benefit requirements for tax-exempt hospitals — including conducting community health needs assessments (CHNAs) and developing implementation strategies to address priority needs. Inspired by this growing commitment to respond to community health needs, Health Care Without Harm’s Healthy Food in Health Care program carried out a national research project to support hospital community benefit professionals and community partners in developing initiatives that promote healthy food access and healthier food environments. The project was supported by a grant from the Robert Wood Johnson Foundation. How are assessments of the community food environment, food access, food behaviors, and diet-related health conditions included in CHNAs? Which food-related organizations and community groups are collaborating in the CHNA process and in implementation strategies? What is the national landscape of community benefit initiatives to address healthy food access and diet-related health conditions? How are these programs being evaluated? What are facilitators and obstacles to community benefit investment in initiatives to improve community food environments, including initiatives with food system sustainability objectives? Community benefit programming to improve healthy food access and reduce risk of diet-related disease: A national survey of hospitals and a forthcoming comprehensive research report discuss our national research findings, which informed the resources, recommendations, and examples presented in the Delivering community benefit: Healthy food playbook. Our representative national survey found that obesity was identified as a health need in 71 percent of respondents’ CHNAs, while food insecurity or healthy food access was identified as a health need in 13 percent of CHNAs. Another key finding was that the majority of community benefit interventions to prevent or treat obesity and diet-related health conditions centered around nutrition education and exercise promotion — and that fewer interventions focused on increasing access to healthy foods. 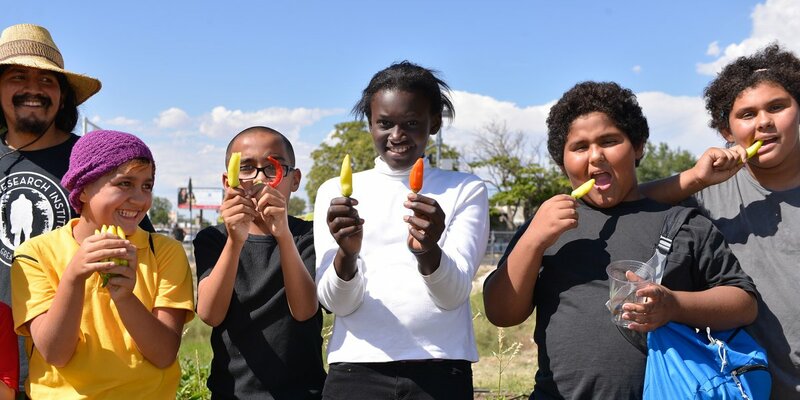 Alongside providing diet and nutrition education, more can be done to address healthy food access in our communities. Health professionals may educate overweight or diabetic community members to eat five servings of vegetables and fruits each day, but if there are no places to buy affordable fresh produce in the neighborhood or families are struggling with food insecurity, then it will be difficult to adhere to the recommendations. Making access to healthy foods both convenient and affordable in our communities is an effective way to impact the social and environmental determinants that are the primary drivers of health or illness. The goal of the "Delivering community benefit: Healthy food playbook"
If a facility has identified obesity, food access, or diet-related chronic health conditions among the priority health needs in its CHNA, then initiatives to promote healthy food access and increased consumption of fruits and vegetables (which are often combined with diet and nutrition education) can be important components of an implementation strategy to address these needs. Additionally, hospitals can extend the reach of their contribution to health by collaborating with community partners to build strong, local economies and vibrant, resilient communities. Investing community benefit and other resources in local and sustainable food initiatives and enterprises can be a pillar of a community development framework that addresses multiple social determinants of health by supporting economic growth, workforce development, access to healthy and affordable food, social cohesion, and personal well-being. The playbook resources discuss numerous ways hospitals can provide community benefit support to initiatives that promote access to healthy foods, healthier food environments, and healthy eating. Our guidance resources include opportunity briefs illustrating hospital participation in a set of impactful healthy food access programs in their communities. In many cases, these strategies also include support for local, sustainable food producers. We also feature case studies of hospitals demonstrating exemplary community engagement and work to address health disparities. The case studies were selected in order to capture regional variation, diverse community settings and hospital characteristics, and to showcase a variety of healthy food access program types. The playbook seeks to promote promising practices that include local food producers and food enterprises as part of a multi-pronged effort to increase access to fresh, affordable, and sustainably produced food; promote health equity, and stimulate the local economy—particularly through creating well-paid jobs in low-income communities. These “win-win-win” initiatives support local and sustainable food production while working to eliminate health disparities and empower and improve the lives of community residents. Health Care Without Harm and Practice Greenhealth offer a variety of tools, educational opportunities, and services to support hospitals in advancing their healing mission as anchor institutions, particularly with respect to health care’s environmental footprint. The food system is the network that integrates food production, processing, distribution, marketing, consumption, and waste management. The way our food is produced, processed, transported, made available for consumption, and consumed has profound impacts on environmental, public, and individual health. At each point in the food system there exist opportunities to support the health of workers, eaters, and the biological systems on which health depends. However, our current food system is failing to meet these opportunities resulting in a rising tide of diet-related disease, inequitable access to healthy food, health and economic challenges for farm and food businesses (and their communities), and environmental degradation which further impacts human health. Diet-related disease - In the United States, the most affordable and frequently consumed diet is high in calories, refined carbohydrates, unhealthy fats, processed products and animal-based foods. The four leading causes of death in the country — and largest sources of health care expenditure — are directly linked to food: stroke, diabetes, cancer, and cardiovascular disease. The estimated health care costs for obesity and diet-related chronic health diseases range from $147 billion to nearly $210 billion per year. Food insecurity - In 2016, 12.3 percent (15.6 million) of U.S. households were food insecure at some time during year. These households were uncertain of having, or unable to acquire, enough food to meet the needs of all their members because they had insufficient money or other resources for food. Food-insecure individuals have significantly higher health care costs, totaling $77.5 billion per year in the United States. Climate change, agriculture, and food access - Consistently accessible and affordable healthy food is put at risk by climate impacts affecting our ability to produce food, including floods, droughts, increases in pests, and changes in average temperatures and growing seasons. The Intergovernmental Panel on Climate Change estimates that agriculture and associated land use changes are responsible for 24% of global greenhouse gas emissions – greater than emissions from industry and greater than the combined emissions of transportations and buildings. Industrial agriculture-related health risks - Conventional agriculture relies on industrial-scale operations with high inputs of energy, water, chemicals and pharmaceuticals and produces a range of negative human and environmental health impacts such as antibiotic resistance and respiratory illness related to exposure to pesticide drift or manure-related ammonia emissions. In particular, occupational exposure to pesticides is linked to asthma and chronic bronchitis, increased risk to certain types of cancers such as leukemia and lymphoma, and other health challenges such as skin rashes, nausea, and eye irritation. Confined animal feeding operations, where animals are routinely provided antibiotics, have been found to contribute to higher rates of antibiotic-resistant bacteria. These confined animal feeding operations cause additional harm to the safety of water supplies and reduce air quality for the surrounding community. Decline in social and economic health - Communities located in close proximity to industrial agriculture activities, particularly concentrated animal feeding operations, have expressed mental stress and inability to leave their homes due to poor air quality, smell, or safety concerns regarding exposure to hazardous substances in the air or water. In addition, farming community wealth is declining. Between 1992- 2007 the number of smaller and mid-size farms declined by 21% due to greater consolidation of the food marketplace, putting these communities at economic risk. 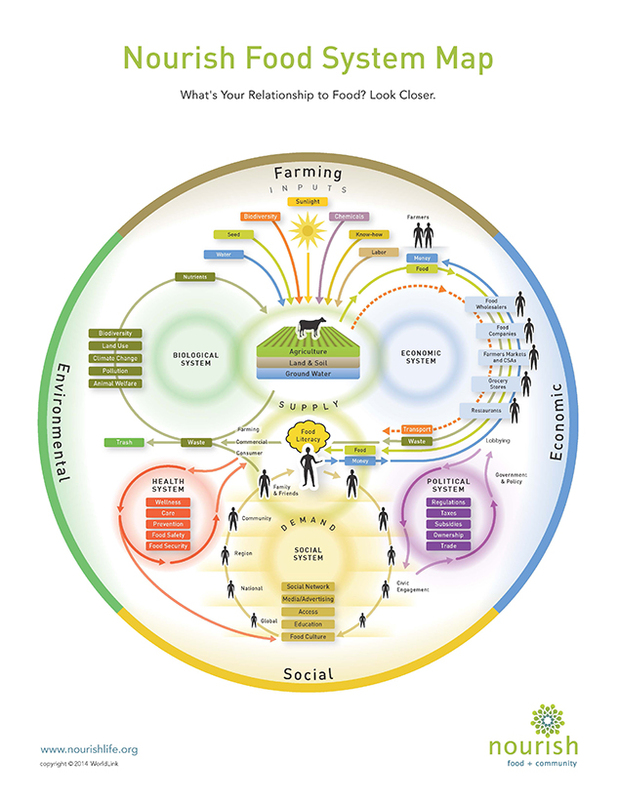 What does a healthy food system look like? A healthy food system is comprised of a diverse network of local food systems that are transparent, health- and wealth-promoting, resilient, sustainable, fair, and economically just. The primary role of this food system is to conserve, protect, and regenerate the human and ecological systems that enable food production to support the needs of all eaters now and in future generations.This restorative food system must ensure equitable access to affordable, health-promoting food. Health professional associations and organizations are recognizing the imperative to build a healthy food system as a foundation for greater health and wealth in the communities they serve. In June 2010, The Academy of Nutrition and Dietetics, American Nurses Association, American Planning Association, and American Public Health Association formalized a set of shared food system principles to support sustainable food systems that promote the current and future health of individuals, communities and the natural environment. As large, mission-driven institutions, hospitals are uniquely poised to assert standards for the foods that are purchased or prioritized. In many aspects of healthy food and nutrition programming, there are opportunities to support local and sustainable food systems for greater cumulative impact. For example, when implementing a double value coupon or fruit and vegetable prescription program, hospitals and partner organizations can identify sources or outlets offering local and sustainable foods to promote to program recipients. This provides value to the individual, supports decreased use of harmful chemical inputs, and promotes economic opportunity for local farms and food businesses. The Healthy Food in Health Care program provides a suite of resources to support health care professionals in understanding key issues in our food system and in taking action. Resources include guidance for collaborating across hospital departments and with community partners to increase the reach and impact of healthy food initiatives. Working closely with Health Care Without Harm, Practice Greenhealth is the leading nonprofit membership and network organization for sustainable health care, delivering environmental solutions to more than 1,100 members throughout the United States. Practice Greenhealth provides its members guidance and support to implement strategies, benchmark progress and celebrate success. Health Care Without Harm seeks to transform health care worldwide so it reduces its environmental footprint and becomes a community anchor for sustainability and a leader in the global movement for environmental health and justice. With offices on four continents and partners around the world, Health Care Without Harm is leveraging the health sector’s expertise, purchasing power, political clout, workforce development, and moral authority to create the conditions for healthy people, communities, and the environment. Working closely with Health Care Without Harm, Practice Greenhealth is the leading nonprofit membership and network organization for sustainable health care, delivering solutions to more than 1,200 members throughout the United States. Health Care Without Harm’s national Healthy Food in Health Care program harnesses the purchasing power and expertise of the health care sector to advance the development of a sustainable food system. Collectively, one-third of U.S. hospitals are part of our network — many of which are connecting their food systems work to their community health mission and programs to better the long-term public and environmental health of their communities. The “Delivering community benefit: Healthy food playbook” shines light on the progressive work of leading hospitals. The Healthy Food in Health Care Pledge is a framework that outlines steps to be taken by the health care industry to improve the health of patients, communities, and the environment. When you see this icon in the playbook, it indicates the facility referenced has signed the pledge. When you see this icon in the playbook, it indicates the facility referenced is a member of Practice Greenhealth. “Just in time for the next community health needs assessment cycle, this valuable toolkit will help with both assessment and planning." Resources on including food access and food environments in the CHNA process. Resources for developing effective interventions to promote healthy food access and healthy eating to prevent or manage diet-related health conditions and promote healthy, sustainable food systems. Recommendations and resources for evaluating healthy food access interventions, reporting support for these initiative types on IRS Form 990 Schedule H, and communicating successes to stakeholders. This research report presents findings from a comprehensive study of hospital community benefit practices to promote healthy food access and healthy eating to address diet-related health conditions. The report identifies opportunities and challenges for greater community benefit investment in healthy food access. It also probes examples of hospital-community collaborations that not only promote healthy food access but also help build thriving communities, strong local economies, and sustainable food systems. This report summarizes findings from a survey of a random sample of community benefit directors at not-for-profit, general medical and surgical hospitals throughout the United States. The survey investigates how hospitals organize community benefit activities and how they include food insecurity, healthy food access, and diet-related disease in their community health needs assessments and implementation strategies. "This playbook is a valuable compilation of key resources, roadmaps and tools for meaningful, collaborative community action to strengthen food systems and improve community health."